As an artist, I have always used pencil and paper to express my artwork. Recently I was stuck in a pickle, as I wanted to add some digital color to some of my hand-drawn images. Without a scanner, this seemed almost impossible. I would get frustrated trying to recreate my image using the touch-mouse pad on my laptop within illustrator. So ultimately I would give up. For Christmas, I received a gift that changed the way I will draw forever. I recieved a Wacom Bamboo Capture. Although I have only had it for about 24 hours now, I am in love! As I sat up all night exploring the excitement that came with my tablet. Not only does it recreate the pencil to paper feeling on your computer, it offers a wide variety of games that arent just games. The games offered by Wacom focus on your drawing ability and preciseness allowing you to improve on the skills you always love. I am really looking forward to created works of wonder on my new Bamboo, and improving my artistic ability in all areas. 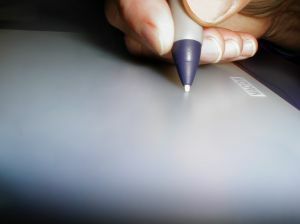 Definately giving the Wacom Bamboo Capture five stars!